>hier soir, je suis arrivée! boston welcomed with sunny, yet unbelievably chilly, arms; upon getting home i was never the happier to shower in my own apartment after very tiring and exhilarating trip. i rushed straightaway to my fridge, where i stashed some contraband cheeses (avec lait cru!) and meats (québecois charcuterie!) that had been hidden and whisked through security. customs security and search must be awfully random, because all i have to do is blink my eyes and say, ‘no, i am not bringing any food through! not even chocolate! or oranges!’ and i just get issued through. i seriously could have poisonous seeds or a very patient small canadian animal in my luggage. who would ever be the wiser? 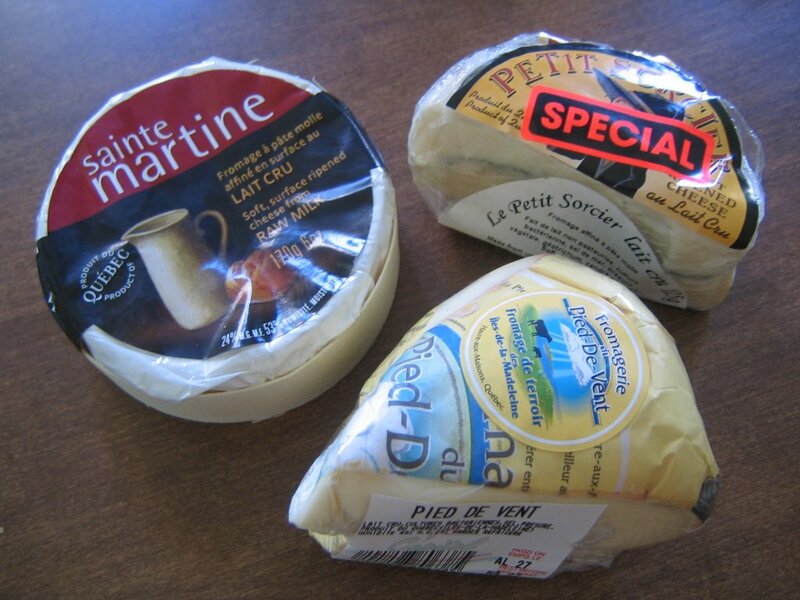 on the left we have fromage à pâte molle sainte martine (which apparently was a finalist at some canadian cheese championship, ascertained from judges who “observed, touched, smelled, and tasted 189 cheeses”), lait cru de vache pâte molle fromage de terroir des îles-de-la-madeleine from fromagerie de pied de-vent, and fromage affiné à pâte molle le petit sorcier (scroll down) from fromagerie chaput pour les dépendances du manoir. 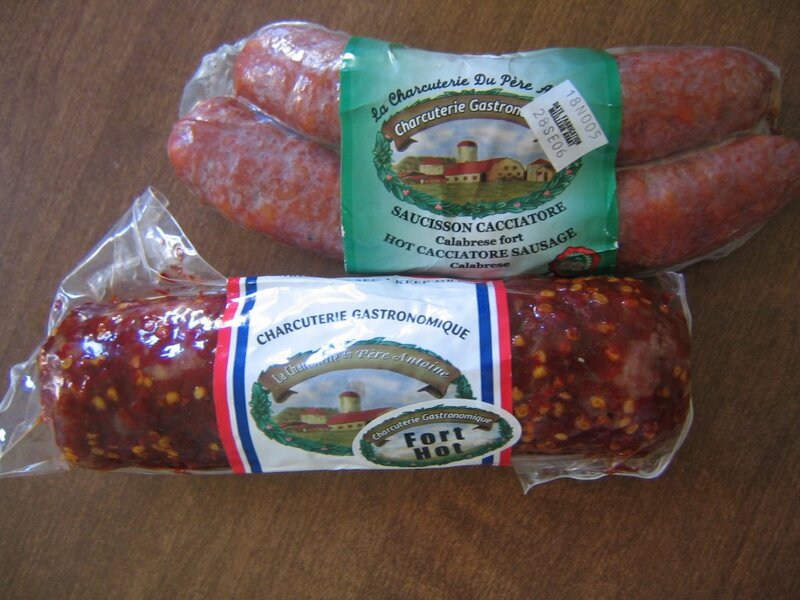 on the right we have rosette de lyon and saucisson cacciatore calabrese fort, both from charcuterie gastronomique, la charcuterie du pére antoine. both are spicy! i’m a little confused as to how to store and serve these sausages. the rosette says “keep dry” and the expiration date is nov 2006. after searching online i see that ‘rosette de lyon’ is an ‘exquisite cured saucisson, a classic dry, french sausage’, and to ‘serve as an appetizer with cornichons and pickled onions’. that sounds yummy, though seems like i just cut and serve it straightaway. however, i’m sticking it in the fridge anyway – think that’s ok? it’s vacuum-packed. 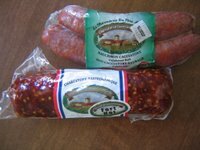 the other saucisson cacciatore label says to keep refrigerated. i found this wikipedia entry on saucisson en francais, but i’m a little confused. if anyone can advise on how to store and serve these things (i.e. i dont want to eat something raw or heat up something i’m not, that’d be helpful). 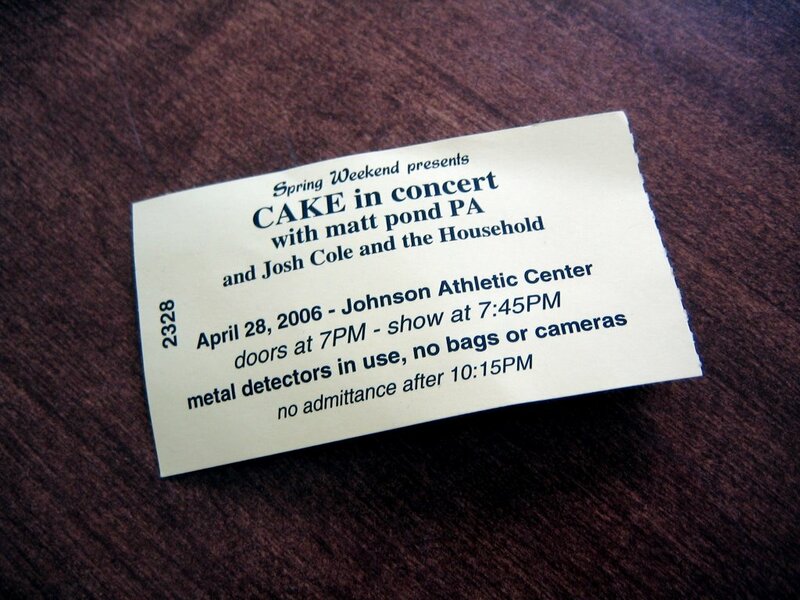 mit’s spring weekend commenced last night with a live concert by the one-and-only cake. you must understand, i have been a cake fanatic (interpret that as you wish) since my salad days as a sardonic, dark-lipstick-wearing, music-obsessed highschooler. i got first hooked by the mariachi + touch-tone deadpan of never there, and was soon seduced by john mccrea’s ridiculously uncool cowboy hat and heartstabbingly witty lyrics. i was lucky to see them in concert (6/11/99!) at the 9:30 club in d.c. (with the old 97s opening), and it was the perfect little dark venue to get lost in. anyway, last night i was feeling very nostalgic and a self-admitted oldskooler who ‘knew them back when.’ i bought will-call tickets when i heard the news; however, i found it irritating how the tech mentions that cake was the fifth choice of the student committee; can we publicly label you nth-string losers, too?. anyway, so nick and i ambled to the athletic center, fetched our tickets, turned around and quickly took in the madness. they have #$*@ing metal detectors, with search teams and security and everything. uh, what? you dont nearly see such an elaborate scene at the airport, much less at live music venues such as the banknorth garden or the orpheum. we were incredulous. i just had my handbag, which i slid on the table and walked through the metal detector. i *never* set off airport detectors (hello, i was just in a two intense airport securities this week with no probs), but of course the thing beeped, and i was unnecessarily frisked. in the meantime, some lady was going through my bag and OPENING EVERYTHING. i have lots of little change purses the size of 3″x5″ as an organization system, and she was unzipping everything. i was so shocked i couldnt say anything. then i said, ‘excuse me, are you looking for something?’ and she responded, ‘weapons, that kind of thing.’ um. this was COMPLETELY intrusive, and she was laying everything out: gloves, postcards, all the junk in my bag. she finally got to the bottom, and reached out and dangled my digital camera out like a dead rat. ‘you cant bring this in. can you go put it in your car (what car, lady?!) or somewhere, you cant bring it in.’ i was furious and asked why i couldnt; i promised not to take pictures (really.) and it’s absurd that everyone can bring in their cellphones and treos and stupid intrusive devices that ring but also have camera capabilities. not only was this entire thing completely stupid (and possibly unconstitutional) but, honestly, why did i have to walk all the way back across campus and everything, wasting an indignant half hour of my life? anyway, it was just ridiculous, and we spoke to both the security manager (who was unbudging) and the student organizers. i understand that no one wants to be sued, etc, but i’m sure CAKE would never want this sort of militia-esque front gate for one of their shows. it throws trust and commonsense right out of the window. i was tempted just to stick my camera down my waistband, walk through, and force them to strip search me. insane, right? what can they do? i secretly kind of wanted to get arrested over a camera, just to illustrate how absurd their system was. but of course, being the diplomatics, we just went back to the lab and dropped off the camera and came back. very much an annoying start to the evening. the place was packed, and being short (4’11.5″) i was near the front but had a face full of SHIRTBACK of the tall person in front of me. if i went on tippytippy toes and cocked my head a bit, i could make out the face of john mccrea. who was awesome! he had the random uniform of jeans, tshirt, zip overshirt, and a trucker hat. still bearded, still plump, still hilariously deadpan. i cant remember all of the set, but they started off with frank sinatra, and then comfort eagle, love you madly, wheels, no phone (‘this is a song about communication technology’), stickshifts and safety belts, the guitar man (‘i thought this song was sad, even before i became a musician, but now i think it even more so’), shadow stabbing, sheep go to heaven, never there. also in this set was a dedication to buck owens, a country artist who recently passed away: ‘hope you guys dont mind that we play a country song.’ john interjected between songs of the set with that lovely dose of irony that secretly makes fun of everyone in the room. as people yelled out song requests, he’s like ‘one of the advantages of our non-preset song lineup is that we, cake, can happily be your kind of push-button jukebox.’ and after a big audience-participation battle-of-the-sexes no-phone chorus back-and-forth (‘sing, men, you misunderstood vikings!’), john remarks, ‘yes, mit! look at that, you can sing together! now you can do *any*thing!’ it was great, haha. as an encore set, they started off with arco arena, which is their only (as far as i know) instrumental piece. i find it impressive enough that a ‘rock’ band issues an instrumental piece, but also to start off the encore with it? it was reassuringly devil-make-care. john then went into an amusing lament of 3/4 time in popmusic and mtv, and slid into their waltz-time ballad of mexico (my favourite!! ), and then swept up the crowd with (of course) the distance. i was squished and hot and increasingly annoyed by some of the obnoxious undergrads, who obviously did not know how to behave at a concert (really! i’m not just being ornery! ok, maybe i am… but still…). but i was very impressed with cake’s set (i love the counterpoint in instrumental lines [following the bass line is a dizzying thrill], and the characteristic whizzing rattle) and was happy to hear that they’re going through independent distribution again. i would happily have another slice of cake. thickly sliced and à la mode, s’il te plaît. >i’m pretty sure that even though you keep the saucisson refrigerated, you can eat it as is. it’s like cold cuts i would say, but if you wanted to put it into a sauce, it would be good. from what i know, it’s ok to eat either sausage as is with some cheese or sliced thin on bread. yum! i sure love cured sausage! >Hey, I was at that show in Fri night too. Only I was there for Matt Pond PA, because an exGF is the cellist. Did you see MP?